A modern interpretation of a classic ranch estate, this house plan's exterior features stately columns, decorative wood brackets, and an inviting front porch. Rugged stonework combines with gentle arches in the front clerestory, dormer windows, and entryway to add architectural interest. Inside, decorative ceilings with exposed wood beams top the master bedroom, great room, dining room and screened porch. This hillside home boasts four fireplaces and a rear wall of windows that capture exceptional views. 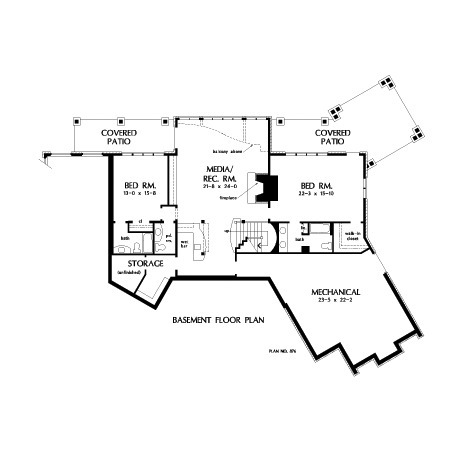 Other custom-styled elements include a wet bar in the media room and a private study/ sitting area in the master suite. Lush yet practical, this home provides an abundance of storage and counter space as seen in the kitchen and laundry/ mudroom. 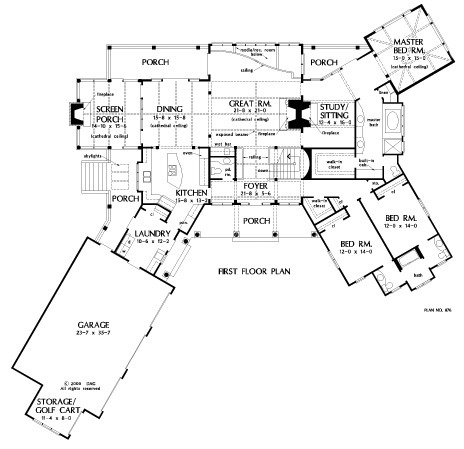 House Dimensions: 106' 1" x 104' 2"
Other #2 : 13' 10" x 13' 2" x 0' 0"
Deck / Patio : 24' 0" x 8' 6" x 0' 0"
Storage (1st Fl.) : 3' 2" x 2' 0" x 0' 0"
Other : 23' 5" x 22' 2" x 0' 0"
Other #3 : 5' 10" x 2' 2" x 10' 0"
Deck / Patio #2 : 15' 0" x 8' 0" x 0' 0"